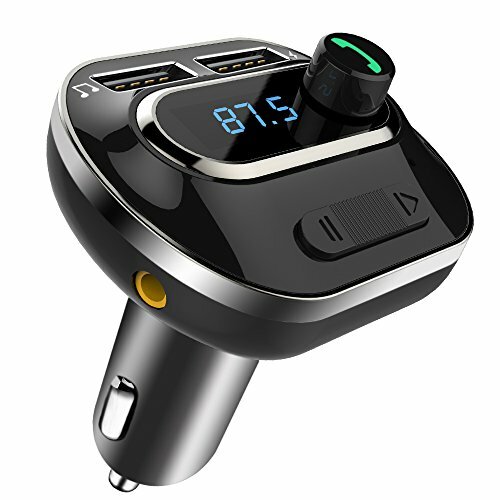 Bcway provides you a There-in-One solution: Bluetooth FM transmitter; Car Charger; Hands-free Car Kit ! Fast Bluetooth pairing; Once paired, auto-connect the last paired device next time. Provides hands-free conversations through your car speakers with great sound quality, bring you convenient and safe driving experience. ♫ With FM signal, it can play music from your Bluetooth-enabled devices to car stereo system. ♫ Also support play music from TF card, USB flash disk (Both≤32GB). ♫ Easy to switch between Bluetooth, TF card, USB disk mode. ♫ The priority play sequence is Bluetooth > TF card > USB. This function supports to connect with car audio through AUX cable, it offers a second way to connect FM transmitter with car audio via AUX cable, instead of FM frequency match. All products at Bcway come with 60 days money-back and 12-month worry-free Guarantee! Plug and Play -- Plug the FM transmitter into your car cigarette lighter socket for power; find a blank frequency for your car radio and keep the FM transmitter at the same one; pair your mobile device with it via Bluetooth. Excellent HI-FI Stereo Sound -- Noise and wind suppressed by CVC technology to create full duplex sound quality; support MP3/WMA, anti- statics design, enjoy the lossless music in your car! Charge Easily -- With 2 USB charging ports (5V/2.1A + 5V/1.0A), you can get two devices full charged simultaneously. Three Playing Modes -- Work with Bluetooth enabled devices, SD/TF card, and U disk; support mobile's A2DP function, you can enjoy music from different ways. If you have any questions about this product by AYY, contact us by completing and submitting the form below. If you are looking for a specif part number, please include it with your message.